In the present chapter we review a series of rat studies conducted in our laboratory during the last five years, investigating the long-term consequences of manipulations of the social environment for behavioural processes which are widely recognised as being of direct relevance to psychosis, and in particular to schizophrenia. The ultimate aim of these studies is to ascertain the relevance and robustness of effects induced by manipulations of the rat’s social environment as animal models of important symptoms and features of human psychosis. There are a number of potential advantages to the modelling approach we are taking. Firstly, our research work has been influenced by the evidence that many psychiatric disorders, and notably schizophrenia, emerge out of early developmental aberrations, and the theory that epigenetic changes induced by these early events express themselves later in the life span as clinical disorder (Weinberger, 1987). 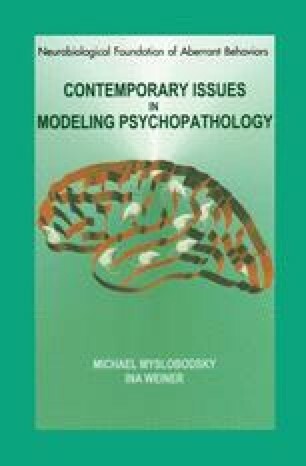 One approach to the animal modelling of this neurodevelopmental hypothesis of schizophrenia is to perform surgical lesions of specific brain structures in the early postnatal period and to monitor the behavioural consequences of these lesions longterm (Lipska, this volume). Our neurodevelopmental approach and that of some other laboratories is non-surgical, and involves specific manipulation of the social environment which, it is hypothesised, will expose the developing brain to events it is not expecting and/or deprive it of events that it is expecting, leading to long-term change in structure-function of specific brain areas.